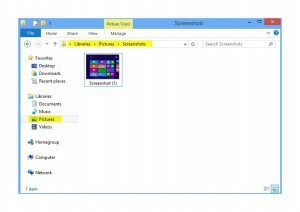 Capture screenshots on Windows, iPhone, iPad, Android, Mac and Linux. Capture screenshot in Windows 8 with a tablet requires no keyboard. Go into the Windows 8 metro mode. Tip: Make sure you press and hold-down the ⊞ button first. A short flashing animation shows that something happened. The screenshot can be found under Libraries -> Pictures -> Screenshots . Windows automatically assigns a filename with a number counting up. Use the same screen capture instructions also for your Windows 8 phone. Instead of the Volume – key use the power button.